*See individual locations for times. Children age four and under ride free! ** See pricing for SouthWest Transit service under Additional Express Service section. Go-To Cards and passes, tokens, coupons and SuperSavers are not accepted on State Fair Express buses. Save time & money with the Metro Transit app. Buy your Bus Bargain Ticket online and have it delivered to your phone or print it at home. For State Fair transit information, call 612-373-3333. 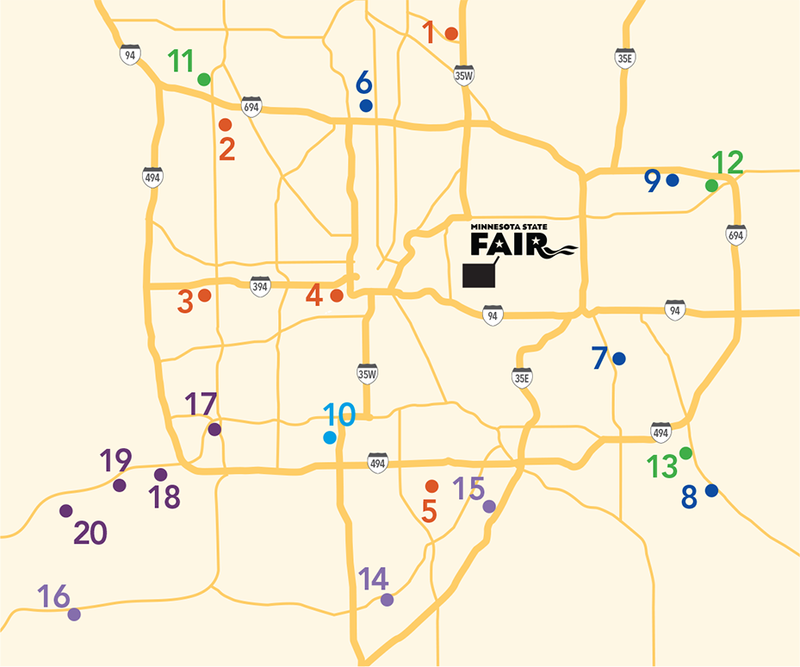 Use the State Fair Express Finder at metrotransit.org/StateFair to find a parking location close to home. Express buses serve the State Fair Transit Hub, which is on the west side of the fairgrounds near West End Market. Bus departure times are approximate. Weekday service begins at 9 a.m. Last return bus is midnight. 2 Brooklyn Park — Bottineau Blvd. & 63rd Ave. Park & Ride, 7000 63rd Ave. N.
4 Minneapolis — Parade Stadium/Dunwoody College of Technology, I-394 & Dunwoody Blvd. Note: Weekday Service at this site begins at noon. 7 West St. Paul – Signal Hills Shopping Center, S. Robert St. & Butler Ave.
8 Cottage Grove – Cottage Grove Park & Ride, Along Hwy. 61 on W. Point Douglas Rd. between 80th St. and Jamaica Ave. Weekend & Labor Day service starts at 8 a.m. Last return bus is midnight. 10 Richfield – Knox Ave. Park & Ride at Best Buy, 7701 Knox Ave.
11 Maple Grove – Maple Grove Transit Station, I-94 & Hemlock Ln. Return service is from noon to midnight. 14 Burnsville – Burnsville Transit Station, Hwy. 13 & Nicollet Ave. Hourly service to fair on weekdays 7 a.m. to 9 p.m.; service every 30 minutes on weekends and Labor Day. Hourly service to fair on weekdays 10 a.m. to 9 p.m. Service every 30 minutes from 8 a.m. on weekends and Labor Day. 16 Shakopee – Marschall Road Transit Station, 1615 Weston Ct. Hourly service from 8 a.m. to 9 p.m. on weekends and Labor Day. NOTE: Bus Bargain Tickets and Mobile App are not valid at these locations below. Cash only. Last return bus is at 11:30 p.m.
17 Eden Prairie – Wooddale Church, 6630 Shady Oak Rd. Weekdays only. Service approximately every 15 minutes from 7:30 a.m.
18 Eden Prairie – SouthWest Station, 13500 Technology Dr. Weekends and Labor Day. Service approximately every 15 minutes from 7 a.m.